Azure 在世界各地的多个地理位置运营。Azure operates in multiple geographies around the world. Azure 地理位置是至少包含一个 Azure 区域的规定世界区域。An Azure geography is a defined area of the world that contains at least one Azure Region. Azure 区域是包含一个或多个数据中心的地理位置内的某个区域。An Azure region is an area within a geography, containing one or more datacenters. 每个 Azure 区域与同一地理位置中另一个区域配对。Each Azure region is paired with another region within the same geography, together making a regional pair. 但巴西南部除外，它与自身地理位置外部的某个区域配对。The exception is Brazil South, which is paired with a region outside its geography. Azure 将跨区域对序列化平台更新（计划内维护），以便一次只更新一个配对区域。Across the region pairs Azure serializes platform updates (planned maintenance), so that only one paired region is updated at a time. 如果发生影响多个区域的中断，则每对中的至少一个区域将优先进行恢复。In the event of an outage affecting multiple regions, at least one region in each pair will be prioritized for recovery. 印度西部的不同之处在于，它仅在一个方向与其他区域配对。West India is different because it is paired with another region in one direction only. 印度西部的次要区域是印度南部，而印度南部的次要区域是印度中部。West India's secondary region is South India, but South India's secondary region is Central India. 巴西南部与其他区域的不同之处在于，它与自身地理位置外部的区域配对。Brazil South is unique because it is paired with a region outside of its own geography. 巴西南部的次要区域是美国中南部，但是美国中南部的次要区域不是巴西南部。Brazil South’s secondary region is South Central US, but South Central US’s secondary region is not Brazil South. US Gov 爱荷华州的次要区域是 US Gov 弗吉尼亚州，但 US Gov 弗吉尼亚州的次要区域不是 US Gov 爱荷华州。US Gov Iowa's secondary region is US Gov Virginia, but US Gov Virginia's secondary region is not US Gov Iowa. 美国弗吉尼亚州政府的次要区域是美国德克萨斯州政府，但美国德克萨斯州政府的次要区域不是美国弗吉尼亚州政府。US Gov Virginia's secondary region is US Gov Texas, but US Gov Texas' secondary region is not US Gov Virginia. 我们建议你跨区域对配置业务连续性和灾难恢复 (BCDR)，以便从 Azure 的隔离和可用性策略中受益。We recommend that you configure business continuity disaster recovery (BCDR) across regional pairs to benefit from Azure’s isolation and availability policies. 对于支持多个活动区域的应用程序，我们建议尽可能使用区域对中的这两个区域。For applications which support multiple active regions, we recommend using both regions in a region pair where possible. 这将确保应用程序的最佳可用性，并在发生灾难时最大限度地缩短恢复时间。This will ensure optimal availability for applications and minimized recovery time in the event of a disaster. 以下图 2 显示了使用区域对进行灾难恢复的虚构应用程序。Figure 2 below shows a hypothetical application which uses the regional pair for disaster recovery. 绿色数字突出显示了三个 Azure 服务（Azure 计算、存储和数据库）的跨区域活动，以及这些服务如何配置为跨区域复制。The green numbers highlight the cross-region activities of three Azure services (Azure compute, storage, and database) and how they are configured to replicate across regions. 橙色数字突出显示了跨配对区域部署的独特优势。The unique benefits of deploying across paired regions are highlighted by the orange numbers. 如图 2 所示。As referred to in figure 2. Azure 计算 (IaaS) - 必须提前预配附加的计算资源，以确保在发生灾难期间另一个区域可以提供资源。 Azure Compute (IaaS) – You must provision additional compute resources in advance to ensure resources are available in another region during a disaster. 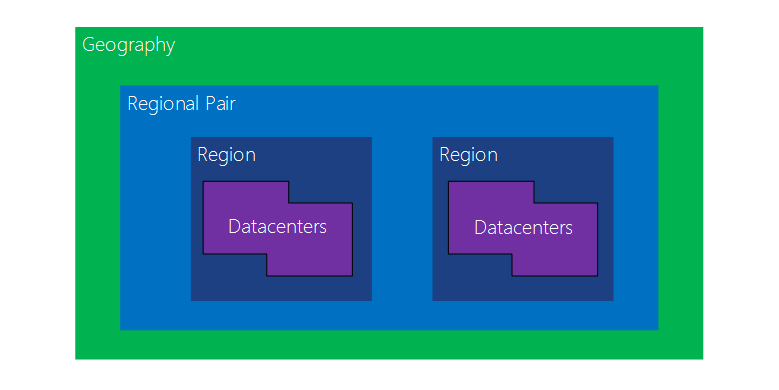 有关详细信息，请参阅 Azure resiliency technical guidance（Azure 复原技术指南）。For more information, see Azure resiliency technical guidance. 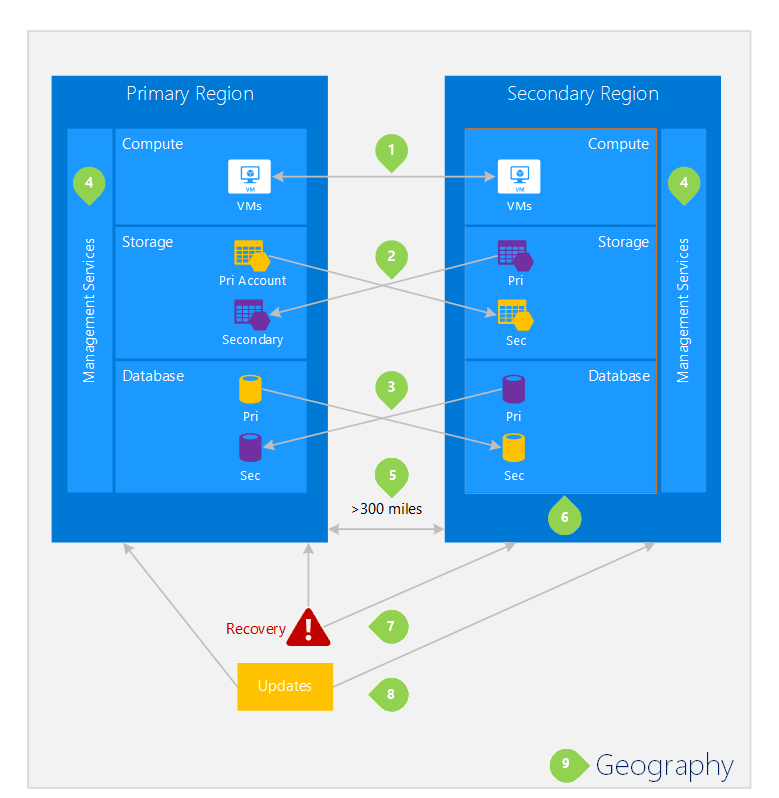 Azure 存储 - 创建 Azure 存储帐户时，将默认配置异地冗余存储 (GRS)。 Azure Storage - Geo-Redundant storage (GRS) is configured by default when an Azure Storage account is created. 使用 GRS 时，数据会在主要区域自动复制三次，并在配对区域复制三次。With GRS, your data is automatically replicated three times within the primary region, and three times in the paired region. 有关详细信息，请参阅 Azure 存储冗余选项。For more information, see Azure Storage Redundancy Options. Azure SQL 数据库 – 使用 Azure SQL 数据库异地复制，可以将事务的异步复制配置到全球任何区域；但是，我们建议在配对区域中为大多数灾难恢复方案部署这些资源。 Azure SQL Database – With Azure SQL Database Geo-Replication, you can configure asynchronous replication of transactions to any region in the world; however, we recommend you deploy these resources in a paired region for most disaster recovery scenarios. 有关详细信息，请参阅 Azure SQL 数据库中的异地复制。For more information, see Geo-Replication in Azure SQL Database. Azure 资源管理器 - 资源管理器原本就能跨区域提供组件的逻辑隔离。 Azure Resource Manager - Resource Manager inherently provides logical isolation of components across regions. 这意味着某个区域发生逻辑故障不太可能会影响另一个区域。This means logical failures in one region are less likely to impact another. 物理隔离 - Azure 希望区域对中数据中心之间的距离尽量至少保持 300 英里，不过，要在所有地理位置满足这个要求并不实际且不可能。 Physical isolation – When possible, Azure prefers at least 300 miles of separation between datacenters in a regional pair, although this isn't practical or possible in all geographies. 物理数据中心隔离能够降低自然灾害、社会动乱、电力中断或物理网络中断同时影响两个区域的可能性。Physical datacenter separation reduces the likelihood of natural disasters, civil unrest, power outages, or physical network outages affecting both regions at once. 隔离受限于地理位置的约束（地理位置大小、电源/网络基础结构可用性、法规，等等）。Isolation is subject to the constraints within the geography (geography size, power/network infrastructure availability, regulations, etc.). 平台提供的复制 - 某些服务（例如异地冗余存储）提供自动复制到配对区域的功能。 Platform-provided replication - Some services such as Geo-Redundant Storage provide automatic replication to the paired region. 区域恢复顺序 - 如果发生广泛中断，会优先恢复每个对中的某一个区域。 Region recovery order – In the event of a broad outage, recovery of one region is prioritized out of every pair. 可以保证跨配对区域部署的应用程序在其中一个区域中优先恢复。Applications that are deployed across paired regions are guaranteed to have one of the regions recovered with priority. 如果应用程序部署在未配对的区域中，则可能会发生恢复延迟；最坏的情况是，选中的两个区域可能最后才会得到恢复。If an application is deployed across regions that are not paired, recovery might be delayed – in the worst case the chosen regions may be the last two to be recovered. 依序更新 - 计划的 Azure 系统更新将按顺序发布到配对的区域（不是同时发布），以便在出现罕见的更新失败时，将停机时间、Bug 影响和逻辑故障的可能性降到最低。 Sequential updates – Planned Azure system updates are rolled out to paired regions sequentially (not at the same time) to minimize downtime, the effect of bugs, and logical failures in the rare event of a bad update. 数据驻留 - 一个区域驻留在与其配对区域相同的地理位置（巴西南部除外），以符合税务和执法管辖范围方面的数据驻留要求。 Data residency – A region resides within the same geography as its pair (with the exception of Brazil South) in order to meet data residency requirements for tax and law enforcement jurisdiction purposes.